Snow, snow go away. Come again another day. Even if the administration took to singing this song, it would hardly help stop the winter weather Harford County has been receiving. As a result of the weather, the administration made the decision to create a new policy and institute Cyber Days to keep students from having to make up snow days. On Cyber Days, all teachers have to post at least a 30-minute assignment for each class scheduled to meet that day. Students then have to complete these assignments during their day off and have the assignments ready for the next day they attend school. According to Principal Madelyn Ball, the decision was made at the suggestion of teachers because “we were really worried about how we could possibly [make up for all the missed snow days].” The new policy, instituted in mid-February, was the solution to ensure that days were not taken from Spring Break or tacked on to the end of the year. Cyber Days will replace snow days, and students will not have to make up these missed days. Already, there have been three Cyber Days. “The only time this isn’t going to work well is when we have the ice storms and students don’t have electricity,” Ball said. However, in accordance with the Cyber Day policy, Ball said the school will be “flexible.” As long as students bring in a note from home, they will be given more time to complete the work they were unable to complete due to power outages. Generally though, the majority of students are not in favor of Cyber Days. According to The Patriot survey of 108 students on March 3, 52.9 percent of students hate Cyber Days, and another 21.2 percent of students dislike Cyber Day. Only 7.7 percent of students actually like or love Cyber Days. 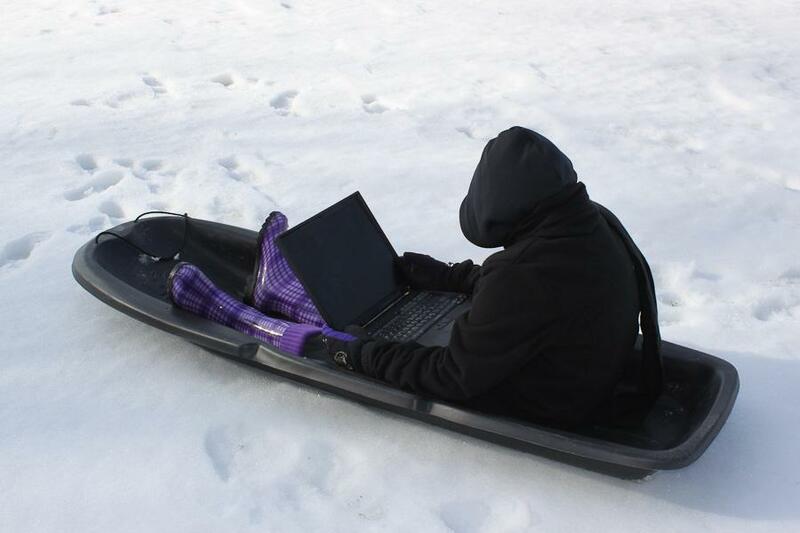 Do you think Cyber Days should replace snow days? According to The Patriot survey, 47.6 percent of students have an hour or more worth of Cyber Day work for each class, and 25.2 percent of student have 45 minutes worth of work for each class. Only 21.4 percent of students actually spend the correct amount amount of time or 30 minutes on their assignments. “I would rather be at home doing Cyber Day than being at school, but I feel like it’s an inconvenience because some teachers give you work when you don’t even have their class that day, and you have to bring all your books home,” senior Megan Brulinski said. Not all students are negative. One student from The Patriot survey said that “I think it’s a lot easier than schooldays. I know that I can get through math work in half the class time, but other students require the whole class. I now have more time to focus on other subjects that others find easier. I work at my speed and still receive the same education as everyone else. One of the biggest problems with the snow days Ball noticed was that there was a struggle to maintain a rhythm with all the interruptions. According to Ball, Cyber Days will help to improve and maintain the rhythm when we don’t have school. “The one thing we need to do is give teachers professional development on how to teach new material on Cyber Days,” Ball said. Math teacher Sean Connolly thinks “that it is a good idea” to have Cyber Days. “Students can still learn using the internet. The students are going to be engaged on the snow days, and learning can take place. As a math teacher, new material can be attempted, but sometimes it can’t be replaced by actual direct interaction between the teachers and the students that have questions,” he said. However, Connolly does believe this problem could be solved in the future by using Skype during Cyber Days or other similar programs. Despite all of this, 60.9% of students that responded to The Patriot survey said they learn less on Cyber Days than on a normal school day. Ball also said that this new policy will continue in future years. JC will no longer have snow days, only Cyber Days. Additionally, while Ball said that the calendar for next year has already been planned, she recognized that the calendar needs to be revisited in light of the new Cyber Day policy. According to her, the options are to either shorten the school year or to give students off for random holidays throughout the year. JC is not the only private school that can switch to Cyber Days. Ball said that any school that has a one-to-one laptop to student ratio has the ability to make this call. “I know Harford County does not plan to put any snow days into the calendar for next year,” Ball said. However, she also said they do not plan on having Cyber Days. According to her, Harford County just plans to add on to the end of the year any days that need to be made up. For JC, Ball said that this “doesn’t help” students. If this happened, seniors would never make up the days. AP classes, without snow make-up days, would struggle even more to fit in information, and the school’s international students would have a problem because they have to buy their plane tickets in advance and the date the school year ends cannot keep changing. Hope Kelly is the Editor in Chief for The Patriot and jcpatriot.com.